garden withoutdoors | There is nothing half so much worth doing as messing about with bulbs. Indoors or outdoors it doesn't matter. There is nothing half so much worth doing as messing about with bulbs. Indoors or outdoors it doesn't matter. I've put 4 of the largest cleomes in that black pot on the left (up on the table to avoid slugs) and put each of the nepeta cataria in a large pot. That one was partly eaten by a cat (visitor Jeffrey) and Polly Pocket also ate a few leaves.. I am so happy to have sea holly - that I haven't spent a lot on in the garden centre. Slugs have eaten those from last year as soon as they started coming up this year - but I collected and planted seeds from them last year and now this year, they are blooming. Not as exuberant as those from the garden centre last year but they're getting established, have the challenge of growing in pots and coping with drought (which they'd be able to cope with after getting established). The stems are starting to turn purple, in that fantastic electric way they have of doing so. I am intrigued with these new forget-me-nots. They have appeared in these "garden in a pot"s I tend to have with things that have self-seeded, this example with stachys byzantina, ox-eye daisy, hollyhock and this tiny-flowered forget-me-not, much smaller than my usual forget-me-nots which have all finished now for this year. these are my usual forget-me-nots flowering back in April, the flowers are enormous compared to the one above, I'm wondering if common or wood forget-me-not?? close-up of the recent tiny-flowered plant, field forget-me-not?? I love buds, sometimes more than the flowers. These phlox buds are great. I got 3 small plants but the slugs got 2 of them so this is my only one left. I don't know why some morning glories flower so quickly when they are so small. Most are still growing and no flowers yet. I am still surprised when I get flowers from seeds I planted. I shouldn't be but it's so often hit and miss. Black Swan poppies and echium Blue Bedder. The poppies only last a short time so in just the last few days I have 3 seed heads without petals. The terracotta pot on the right on the bricks has an echium vulgare which I put next to the echium Blue Bedder to compare the flowers, difference in size but otherwise extremely similar. I have one largish red poppy plant after sowing seeds the last few years. One of the more difficult plants to grow from seed. View from my stairs down to the garden, flowers: cornflowers, delphiniums, verbena bonariensis, foxglove, knautia, scabious, corn cockle, tomatoes, poppies, honeysuckle, nepeta; buds: globe thistle; still awaiting buds: lupin and monarda. I love veronica. The fancy cultivars are nice but don't last. The bog standard ones at least come back every year. The bees will visit but not when there are exciting things like poppies. Sadly no iris flowers this year. They were choked by green alkanet and too dry. The weather has been terrible. Drought in my garden unless I water it and I'm only watering my pots. I can't water the entire garden. Two things happened recently, I saw this trailing bellflower on a church wall in a village in the Surrey Hills on the way home from the South Downs and I realised just how much the trailing bellflower is self-seeding in my garden and round the corner. It seems to have taken off in my garden much more extensively in the last year or two. It's such a picturesque effect of it trailing on walls and in the garden, I thought it's finally time to take notice (which for me is taking photos and blogging about it). I used to call it campanula without knowing which one but on researching it I think it is Campanula poscharskyana, commonly called trailing bellflower. Victor decided to use a brick for a pillow today. Nepeta (catnip) to the left, scabious to the right. I'm having some difficulty with the sea holly. I am growing them in a trough to keep the slugs off them and because of lack of room in the garden to plant them in the ground. I guess I'm not doing something right as the flower stems at the top are collapsing. I guess my watering regimen is all wrong - too much water after not watering and them drying out? At least a couple of times watering has perked them up but lately I see the stems are permanently damaged so cut those off. I need to let the trough dry out a bit now after over-watering I think. And from what I'm reading online, I should have put in more drainage. I pruned the honeysuckle and it responded by bursting into flower. The smell, in the evening especially, is amazing. I have a new hardy geranium in the back garden. I think it was one of those perennial specials last summer, like buy 5 for the price of 4. It's settled in and is blooming well this spring. I've tried to grow monkshood from seed a few times without success so when I saw these plants at a garden centre, I decided to buy them as it was the only way I was going to have monkshood in my garden. Something I grew from collected seed last year that did work is chinese lanterns. They are flowering - very subdued white flowers - but it means there'll be lanterns in the fall. I seem to have spectacular success with seeds or total failure. The lesser knapweed were a success and they've self-seeded like mad. The globe thistles have been a huge success. They've taken over! They've blocked the sea holly planted to the left but the sea holly in the trough in front seem to be doing well. The globe thistles are also taking over this flowerbed. I moved some that had self-seeded here last year and they're back! At least these iris foetdissima are out of the way at the back of the garden. They bloom, even in the shade. I planted some next door and they're blooming as well. My first scabious of the season. That centaurea montana in the background is pictured below. My auricula theater didn't really happen this year. My patio was in disarray as a ladder had to be put up to repair the roof. I did buy 4 new auriculas last year; this is the best one (Blue Yodder), maybe even the only new one to bloom (one had died). I must admit I wasn't really able to keep track of them all. I am going to try to get it ready next year in time. (deadnettle self-seeded in the pot). I have a red corn poppy - finally. I tried so many packets of seeds with only a couple pathetic flowers resulting so when I saw these at the garden centre in the inexpensive "wildflower" range I bought a few and they are looking great, tall, lots of buds and actually blooming. I gathered together some of the forget-me-nots that have self-seeded in pots. I wanted to keep them until they finish flowering (they die back then) but wanted to free up the pots. I didn't want to throw them all in the compost pile, why not grow them ON the compost pile. I heard mention of 'dog violet' recently and realised I didn't know what that meant so googled it. Dog violet doesn't have a scent so it's not viola odorata which I assumed all violets were. I noticed these next door and picked one - no scent. So these are dog violets. I don't know how they differ physically, must research. 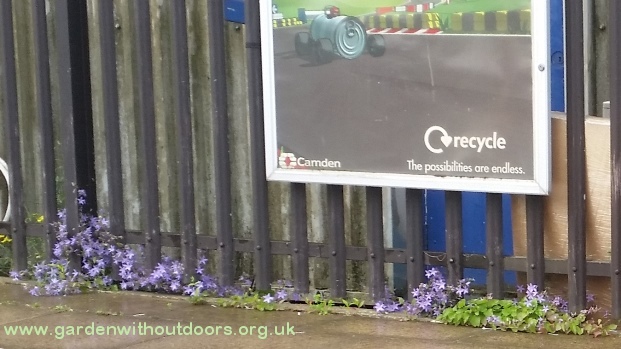 I saw this Bee Friendly Trust planter at a Highbury and Islington overground platform. (was there a plant in that gap that someone has taken?). I guess I started my seeds and corms a bit late so I don't have much new yet, thank goodness for the honesty, green alkanet and forget-me-nots, and previous years' chives. Some of my seedlings have been devastated by slugs, some are looking promising, see my Seeds page for more info. Growing from seed does take a long time so there is that temptation for instant colour from the garden centre. I am so happy to see some fox and cubs in this flowerbed and looking good. I had removed the green alkanet just from this small area but I had to repeat the exercise as some had snuck in. There were also forget-me-nots that had invaded the cleared space so I removed those as well. That left me a bit of room to plant in the ground a meadow clary ("wildflower" from the garden centre) and an oriental poppy (had bought 3 from Peter Nyssen but the other 2 are in slug damage intensive care). And I seem to have the globe thistles back. I do love them but not in the front there blocking the sun for the other plants. I did move some but more have self-seeded there. I'm going to have to be more brutal like I was with the green alkanet (believe me it is all over the rest of the garden! just not in this small space). Another knautia macedonica Melton Pastels (one of my most successfully grown from seed flowers) I potted up for a neighbour. I'll see how this pot and the one above look and put them outside their door when they are looking promising. I've put some of the corncockle and echium Blue Bedder seedlings around the edge. Speaking of pests, these scarlet lily beetles have managed to find the few lillies in my garden: snakeshead fritillaries. I haven't done anything about them and am not going to. I think we should avoid chemicals in the garden. I went to the South Downs one day last week and saw primroses in the wild. I've never seen these horsetail in person before - very unusual - prehistoric-looking. I haven't tried these Princess Irene tulips before but I think they are exquisite with that glaucous sheen. Since at least 2013 I've been trying to grow corn poppies from seed for the centenary of World War I but they proved to be extremely difficult to grow from seed so when I saw these in the "wildflower" range at the garden centre I bought some. They do seem very crowded in the pots but as the label said they don't like root disturbance I decided to just plant them as they were. If we can't identify the smallest plants, we may weed out some wonderful self-seeding wildflowers: green alkanet, forget-me-not, common field speedwell, deadnettle. Sometimes I forget, the most likely id is from something I already have in my garden (Occam's Razor?) Like the veronica beccabunga above which spread from nearby, this plant that self-seeded in my wall, looks remarkbly like wood avens which I only just realised. It's likely to be that as I have lots of wood avens, in spite of pulling it out every chance I get. That is one wildflower I just don't like. At the bottom is the seedling in the wall, above is a wood avens plant I pulled up from the garden to compare it with. 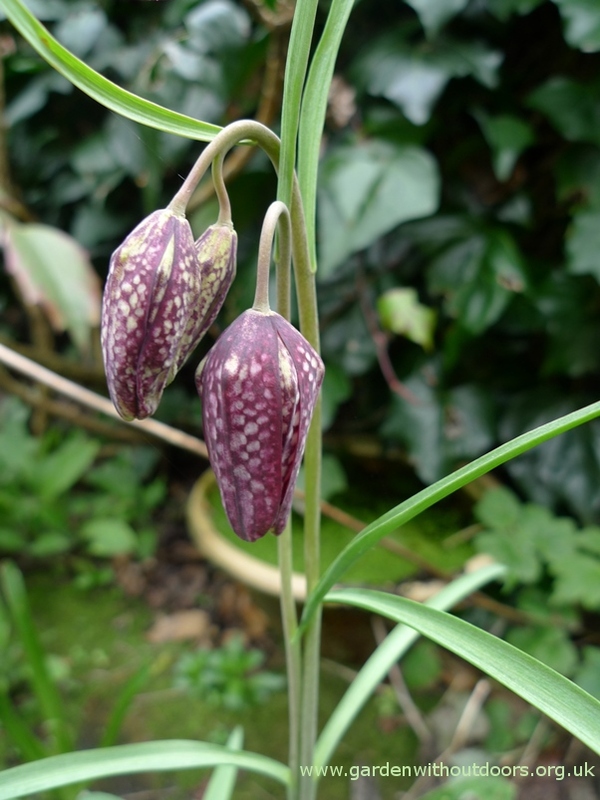 I can't keep track of what I planted where and the snakeshead fritilary look very grass-like before the buds appear, luckily I didn't "weed" them out. It's finally good enough whether to go out into the garden, or at least it was for a few hours today, raining again now. I planted out my spent, previously forced, hyacinth bulbs. It reminded me that if you dig or plant in the garden, weeds will respond! I planted some small plants last autumn and I had so many creeping buttercup to dig up today. I also had grass, two types, one that spreads and one that appears to be self-seeding and makes a clump. I think the clump type is couch grass but I must look into them further. Another spreader underneath is snowberry. It spreads like mad. I didn't catch this one in time and it grew to be a monster - in one of my hosta pots so it had to come out. It's early enough that there's some room in the garden for the previously forced hyacinth bulbs to be planted, before the green alkanet has gone mad - lots of small plants in the next 5 photos.